Look what I found at Walmart. I like minty shave creams and soaps so I had to try it. I liked the original in the red capped tube but I lost that one to a lady friend of mine. I'll try it out tomorrow morning with the Sensor and my Semogue 1520. (01-16-2016, 01:19 AM)chevyguy Wrote: Look what I found at Walmart. I like minty shave creams and soaps so I had to try it. I liked the original in the red capped tube but I lost that one to a lady friend of mine. I'll try it out tomorrow morning with the Sensor and my Semogue 1520. Cremo Cooling Shaving Cream is great stuff. It's got the right amount of Cool, and slickness for great glide. It doesn't have a lot of cushion but it does give good protection due to there being a thin layer being left on the skin after the razor pass. I used my Semogue 1520 to reapply the Cremo in between passes. I enjoyed a shave that was 99.9% bbs, and irritation free. I did two passes, wtg, and atg. Cremo makes going atg easy and comfortable. At just under 6 dollar's Cremo is a great value and worth a try. Sounds like it's worth a shot. I've never tried it before, but have seen it in stores. Thanks Clayton! I have a tube of regular Cremo but never tried it with a brush. I used it about 3 times when I first started using a DE and haven't used it since. It's not bad I just didn't like the way you apply it per the instructions without a brush. (01-17-2016, 04:57 AM)Hobbyist Wrote: I have a tube of regular Cremo but never tried it with a brush. I used it about 3 times when I first started using a DE and haven't used it since. It's not bad I just didn't like the way you apply it per the instructions without a brush. It works pretty well with a brush. This morning I'm going to change things up a bit and use it as a preshave and face lather my Arko SS over it. (01-17-2016, 03:40 AM)wyze0ne Wrote: Sounds like it's worth a shot. I've never tried it before, but have seen it in stores. Thanks Clayton! Your welcome Jeff. On the Cremo website there is a full refund rebate form that allows you to try Cremo for free. Even includes all their skin care products. I'm gonna try it as a pre-shave. Good thinking! I have the regular Cremo but have not used it in ages. Works great for a Super Lather too with your favorite soap. I am a sucker for menthol so this is right up my alley- thanks Clayton for the heads up. (01-18-2016, 03:13 PM)kwsher Wrote: I have the regular Cremo but have not used it in ages. Works great for a Super Lather too with your favorite soap. You got it buddy. I used it as a preshave this morning with my Mama Bear/Honeybee Sue Lime Coconut SS and it really helped out the soap in the skin protection, and razor glide areas. I did my usual two pass shave and ended up bbs everywhere except above my lip, and it was close to it there too. I liked the added Menthol/Peppermint coolness that it added to the soap also, it was quite pleasant. 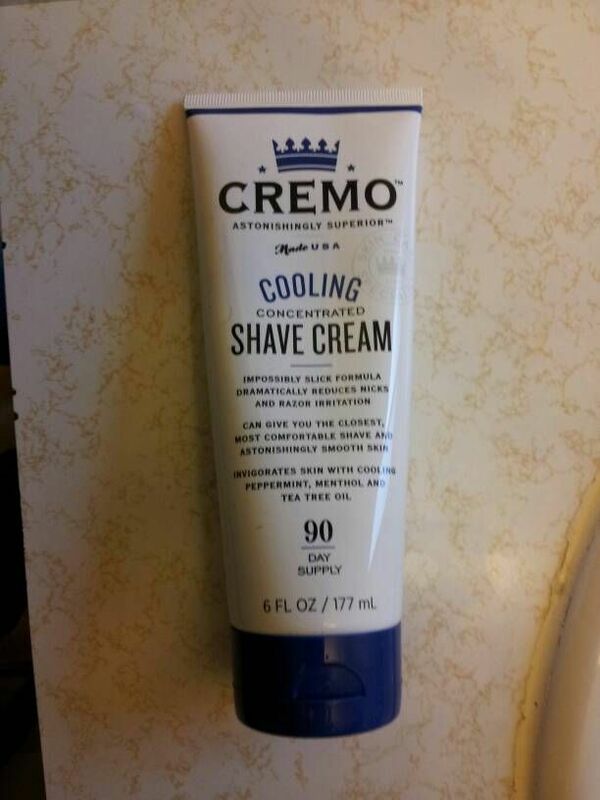 Cremo works great as a preshave, I've been using it all week underneath my soaps and creams. I really like it underneath my Proraso Blue.